A UK pub has introduced a beer brewed for dogs on its menu so that patrons have no excuse to leave their pets at home when they go out for a drink. The Brandling Villa in South Gosforth, Newcastle, decided dogs should not miss out on the craft beer revolution currently sweeping the country and now offers the non-alcoholic, beef-flavoured beer for its customers’ furry friends. The drink is made with beer ingredients of malt and hops, but also includes meat extract. It is clearly going down well with the local pet population, as the pub had to order in fresh stock after its first 48 bottles ran out within a fortnight. Not everyone’s pet is a fan, however. Pub manager Dave Carr told The Daily Mail: “It tastes of beef. “I don’t want to give it to my dog without trying it first. It’s pretty revolting and my dog doesn’t like it but I’ve got enough people who drink my stock so it’s nice if my dog doesn’t join in. Everyone else’s dogs love it. We have some regulars: she’ll have a Sauvignon Blanc, he has a pint of Budvar, and Charlie the dog has a dog beer. That’s his regular drink. The unorthodox drink forms part of a wider pet-friendly menu at the pub. Other dishes for pets on the menu include “Chicken a la Franc” – a dog version of chicken chasseur; “Eggs Ladybird” named after chef Sammy Dee’s own dog; and a Sunday roast with “cat” gravy – a beef stock with fish sauce. “I scoped the internet looking for ridiculous stuff, and we became dog-friendly. There aren’t many pubs you can go to with your dog,” explained Carr. The beer at the Branding Villa is not the first brew made especially for dogs. 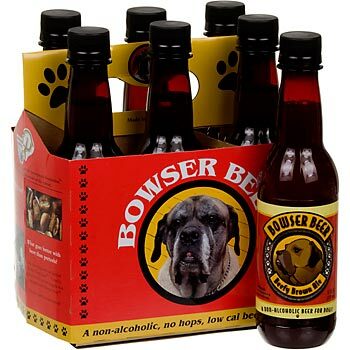 Bowser Beer (pictured above) is made in Phoenix, Arizona, US, from beef or chicken broth with malt barley. It is non-alcoholic, has no carbonation and also free from hops which can be toxic for dogs. What’s next? Champagne for cats?